Sahib is an authentic Indian restaurant located right off of Interstate 26 in Johnson City at the Roan Street Exit, Exit 20 if you are heading south, exit 20A if heading north. It is a little tricky to get to. From Roan Street take a right onto Brown’s Mills Road.. It is located behind the Days Inn, facing the interstate. The food is very good. Vik Vantrana and Chef Gurvinder Singh co-own Sahib. Chef Singh runs the kitchen while his wife, Ekta, and Vik’s cousin, Barry Nirola, manage the dining area. Vik is the general manager overseeing the entirety of the business. While the building is not the newest on the block and is beginning to show its age, the food is marvelous and the service is friendly and accommodating. Barry and our favorite waiter, Daniel, will take good care of you. Sahib receives large catering jobs from distances as far away as Kentucky and Nashville. These areas could easily choose from their own local Indian restaurants but instead prefer to patronize Sahib. We learned that Chef Singh actually taught the chef at Mint (see Mint Indian Cuisine of Boone, NC) how to cook Indian food. 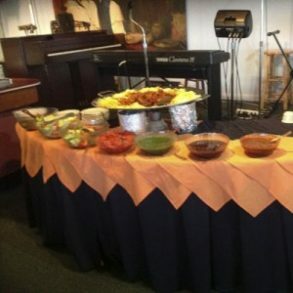 A lunch buffet is offered between 11am and 2pm. Dinner begins at 5pm. You can order off the menu at any time. 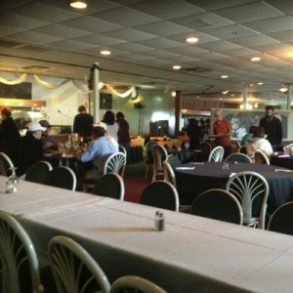 There are usually two to three vegan entrees offered on the buffet menu and another vegetarian offering. You will also find two types of rice and a fried vegetable appetizer called Pakora. 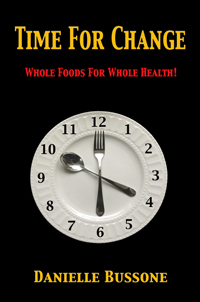 There is plenty to choose from for your carnivorous friends and associates as well. The price of the buffet is $8.99 plus tax. For dinner I counted 4 vegan appetizers ranging from $3.95 to $5.95, and three more which can be made vegan upon request. 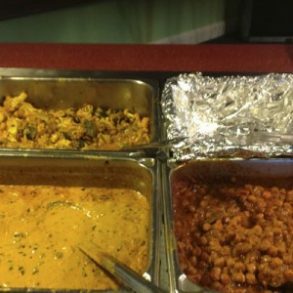 These include Vegetable Samosa, $4.50, (A crispy vegetable turnover filled with delicious vegetables), Vegetable Pakoras, $3.95, (Mixed fresh vegetables in a gram flour batter and fried a golden brown), and Onion Bhajia, $5.95, (Thinly sliced onions dipped in gram flour and spice, fried a golden brown) to name only a few. 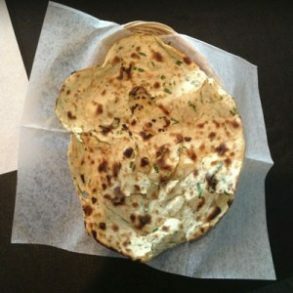 Sahib also offers eight varieties of vegan Indian flat breads and two with vegan options, several fresh chutneys, as well as a house green salad. The flat breads range in price from $2.50 to $3.95. There are 18 vegetarian main dish specialties ranging in price from $9.95 to $12.95. Of these, six are vegan and three more can be made vegan upon request. 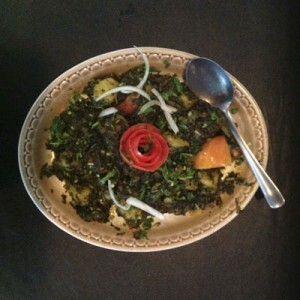 My personal favorite is Aloo Palak, potatoes and spinach cooked in a savory spicy blend, (see video) while Rich’s is Baingan Burtha, roasted eggplant simmered with tomatoes, onions and spices, both $10.95. We always order off the menu. There is just so much to choose from and I want to try everything! For those who have trouble deciding, there is a vegetarian combination platter for one person ($15.95) or for two ($32.95) which can be made vegan upon request. You know a restaurant is really good when you see so many people from that particular ethnic region eating there. Sahib is filled with such clientele as well as those of a fairer complexion. The lunch buffet is a great choice for businessmen and women in a hurry who want a delicious meal. A la carte is perfect for those who like to take their time to work their way through the menu. 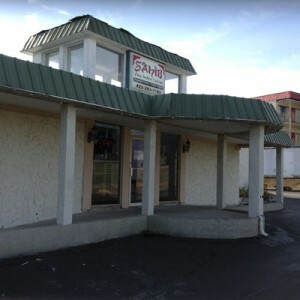 You certainly can’t go wrong enjoying a meal at Sahib.